Quartets are an excellent and fun way to strengthen your ability as an individual singer and performer. Quartets also provide additional opportunities for community performance and are an important foundation for Sweet Adeline choruses. There are quartets for everyone! You may choose to be in a comedy quartet, a competing quartet, or a quartet that gets together for fun. Region 17 quartets encompass all of these! Region 17's Encore Club is a group consisting of Regional Quartet Champions. Every year the members of the winning quartet are inducted into the Encore Club. The Encore Club chorus performs at our Regional Competition and hosts events for our Regional quartets. Read more about the Encore Club here. 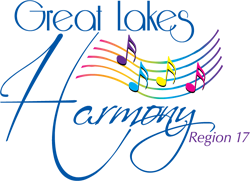 Young Women in Harmony (YWIH), for girls through age 25, teaches emerging voices the skills, joy and rewards of performing and singing four-part harmony, barbershop style. YWIH delivers both musical excellence and education while it gives young women a taste of show business. This program provides educational tools to teach young women the joy of performing this American vocal music art form.